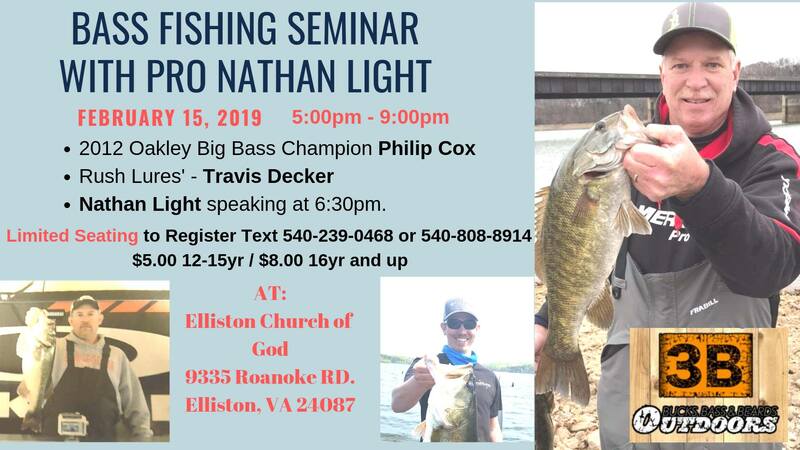 The Elliston Church of God presents Bass Fishing Seminar with Pro Nathan Light on Friday, February 15, 2019. Learn today's techniques for Bass Fishing from 2012 Oakley Big Bass Champion Philip Cox, Rush Lures' Travis Decker and Bass Pro Nathan Light speaking at 6:30 pm. Nathan Light is host of 3B Outdoors TV, has three 1st places in state and regional events and is a Bass Pro Shops Pro Staff member. The cost to attend is $8.00 for ages 16 & up and $5.00 for ages 12-15. Seating is limited. To register, text 540-239-0468 or 540-808-8914. Elliston Church of God is located at 9335 Roanoke Road in Elliston, VA.
To view the event flyer, visit: https://i.imgur.com/QjrfsA0.jpg. For more information, visit: https://www.facebook.com/events/1781498705295014/ or https://www.facebook.com/Elliston-Church-of-God-825256784259952 or call 540-268-5588.